Marcus Stoinis and Adam Zampa enjoy a bromance. 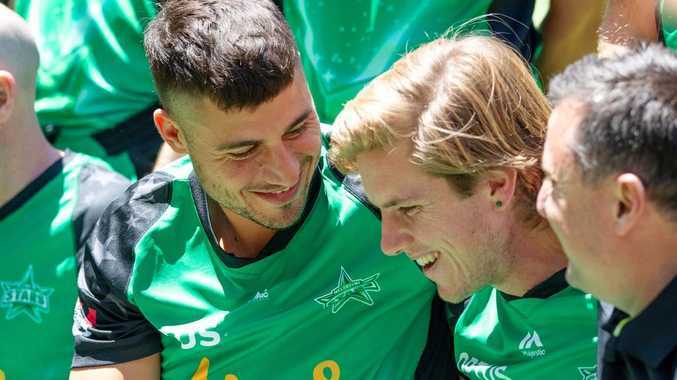 MARCUS Stoinis and Adam Zampa set the internet ablaze with their cheeky, dressing room show of affection during the ongoing series against Pakistan. It was instantly branded a bromance for the ages. But cricket, because of its endless tours and consuming schedules, is renowned for producing deep-seated friendships which can last a lifetime. This was truly a next level bromance, perhaps the greatest in all of sport. England's identical twins were so similar it was said only their mother could tell them apart. They weighed the same and were the same height throughout their lives and they tormented outsiders by normally wearing identical clothes. Neither married - because no woman could come between them. Team-mates called them Romeo and Juliet, so close was the bond they formed opening the batting in Tests. They would go to mass together at Christmas. One would mark the popping crease with a straight line and the other would cross it to form a sign of the cross when they changed ends. They blended well because they had different strengths, Hayden brutalising the ball and Langer using its pace. 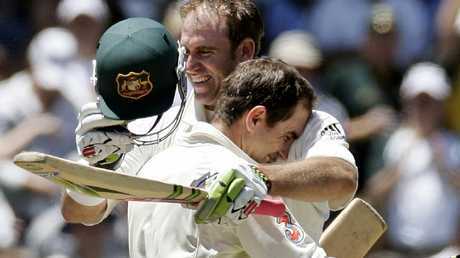 Justin Langer and Matthew Hayden shared the love … and contempt for English attacks. Picture: Mark Baker, AP. So close they even have their own clothing line which raises money for charity, their bond comes from three great common interests - a love of horses, big hitting and quiet drink. The 'Bash Brothers' got on so well at the Brisbane Heat they tried to take their brand global, unified in Pakistan and West Indies competitions and but just missing out on the IPL. Brisbane Heat's "Bash Brothers" Brendon McCullum and Chris Lynn. Picture: Liam Kidston. War-time fighter pilots, debonair heroes, they were great mates on and off the field who were once seen leaving a nurses headquarters in Brisbane a few hours before a Test in Brisbane. They loved sharing funny stories. In England in 1948 a smiling Compton made a beeline for Miller's room to tell him he had just been behind England batsman Jack Crapp when he checked in and simply said "Crapp'' to the receptionist. She replied "second on your right'' and pointed him to the gents toilets. One of the great cricket stories of the 1980s came when Greg Growden rang Whitney's house after he missed selection in the 1989 Ashes squad. Lawson answered and was soon in tears, so shattered was he that his mate missed the tour. Long-time tour room-mates who loved a quiet, soothing ale after stumps, they bonded by the forces of guiding Australian cricket through the turbulent 1980s. Boon was once woken by the sight of Marsh practising his defensive shot in front of the mirror wearing nothing bar his baggy green cap. Geoff Marsh and David Boon celebrate a win over the West Indies, fully clothed this time. Cricket's true odd couple ("he's sensible and intelligent, then there's me,'' Hughes said) and godfathers to each others' children, they had lunch just last week. Gillespie only had six people to his wedding at Port Douglas and Fleming was one of them. They loved watching pro wrestling and listening to heavy metal and stay in weekly contact. Fleming reckons Gillespie has one of the great laughs and tries to flush it out with his dry humour. 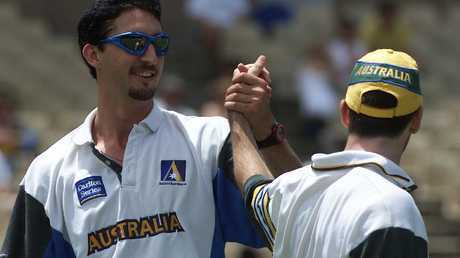 Jason Gillespie and Damien Fleming, forever and always fellow grapple fans. Leg-spinning great O'Reilly was a hot-blooded firebrand of Irish extraction who adored McCabe for his unpretentious personality and rare batting gifts. It was said when O'Reilly lost his temper the only man who could settle him down was McCabe, who would say things like "you are carrying on like a big sook'' and order would be restored. 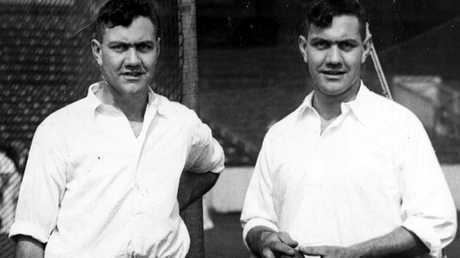 Team-mates then great mates for more than half a century, Benaud said he never saw a better fieldsman than Harvey and loved his straight-shooting approach to life.